On Sunday, December 7, the Very Rev. Archimandrite George was consecrated to the episcopate by His Grace Bishop Gabriel of Montreal and Canada, His Grace Bishop Peter of Cleveland and His Grace Bishop John of Caracas, receiving the title of Bishop of Mayfield. His Eminence, Metropolitan Hilarion could not be present, as was preparing to attend the funeral of Patriarch Alexey in Russia. In a festal and joyous atmosphere, the brotherhood of the Monastery, pilgrims and clergy from many states joined in prayer and witnessed a truly solemn and grace-filled event. Hundreds of people came, even though the weather was not conducive to travel, thus showing their love and support for the Russian Orthodox Church in her consecration of a Bishop to serve the pastoral needs of the many Orthodox Christians whose primary language is English. The newly consecrated Bishop George also ordained hierodeacon Joasaph to the priesthood. Fr. Joasaph is preparing to serve the Russian Ecclesiastical Mission in Jerusalem. In his acceptance speech Bishop George reminded us that "the harvest truly is plentiful, but the laborers are few." May Christ our Lord help His Grace Bishop George and Hieromonk Joasaph to labor in the vineyard of the Church, so that by their efforts and struggles God will grant them His Grace to bear abundant fruit unto the salvation of souls. Bishop George was born on May 25, 1950, in Belleville, Illinois, USA. He graduated from Catholic High School in 1968 and then attended Southern Illinois University from 1968 to 1972. In 1974 he was received into the Greek Orthodox Church in Modesto, California, on the feast of Saint Dimitrios, receiving the name Makarios in honor of Saint Makarios the Great. He joined the Russian Church Abroad in San Francisco in May of 1975 and entered Holy Trinity Seminary in September of the same year. On December 25, 1975(O.S.) Makarios was made a novice by Archbishop Averkii (he was the last novice received by the late Archbishop). As a novice he labored in obedience on the farm and in the cemetery. After a few years in the monastery he was made a riassophor monk on Friday of the First Week of Lent, 1979. He was tonsured to the small schema on Friday of the First Week of Lent, 1980, and given the name Mitrophan in honor of Saint Mitrophan of Voronezh. He was ordained a subdeacon on Palm Sunday of the same year. In 1980 he graduated from Holy Trinity Seminary . Fr George was sent to Mt. Athos by Archbishop Laurus in June of 1981, arriving there on the Feasts of Sts. Peter and Paul. He was tonsured to the great schema by Hieromonk Chrysostomos of Koutloumousiou Monastery, Mt. Athos and given the name George in honor of Saint George the Great-Martyr. 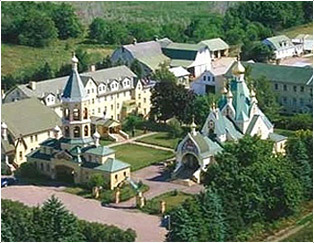 In February, 1986 , Fr George returned to Holy Trinity Monastery and started working on the Printshop of Saint Job of Pochaev in 1986, where he worked until 1998. He assumed editorial duties on Orthodox Life in 1992, which he fulfills to this day. Fr George was ordained a hierodeacon on the feast of St. Michael, 1986 and a hieromonk on Palm Sunday, 1987. 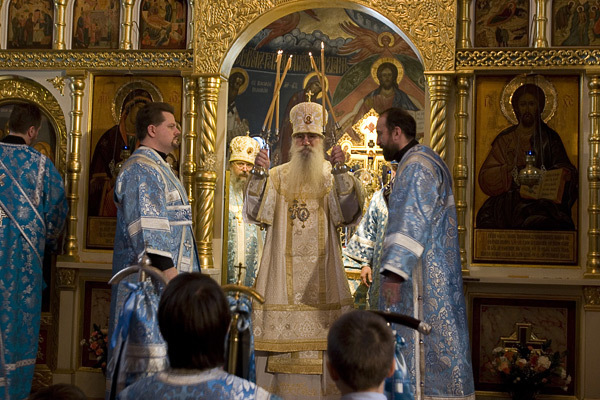 In September 1998 he was elevated to the rank of igumen and archimandrite on Labor Day, 2005. In 1994 he was appointed as economos of Holy Trinity Monastery and made dean of Holy Trinity Monastery in 2007. He is the author of several articles and translations published in Orthodox Life. He has translated a collection of sayings of the Optina Elders, published in the book “Living Without Hypocrisy” by HTM Press in 2006.